Can Sweden tackle the throwaway society? Would you stop throwing things away and get them repaired instead, if it were cheaper to do so? The Swedish government likes to think its citizens would, and is putting the idea into practice. The country's Budget for 2017 will cut the VAT rate charged on minor repairs to things like bicycles, shoes and clothes. 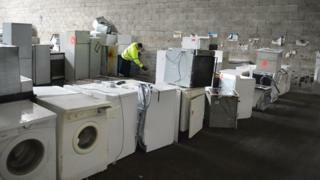 Tax refunds will be offered to people who get their white goods repaired, like washing machines and dishwashers. The VAT rate will be cut from 25% to 12%, and the tax refund will let people reclaim half the labour cost of a repair to white goods and kitchen stoves. The idea of encouraging people to be less wasteful in their everyday lives has been promoted by the Swedish Green party, which is a partner in the country's ruling minority coalition government, along with the Swedish Social Democrats. One of the six Green ministers is Per Bolund, the deputy finance minister. He told the BBC that the plans are part of a wider strategy which the government is launching for sustainable consumption. "The emissions from Sweden affecting the climate are decreasing but emissions from consumption are increasing," he says. "We see an interest in more sustainable consumption from the Swedish consumer and this is one way for the government to make it more affordable." Swedish taxpayers can already reclaim 50% of the labour cost of paid house work, such as employing a cleaner, from their income tax bills. So the minister is confident the new plans will work. "Consumer are quite active in changing both what they buy and how they buy in Sweden, to change the environmental impact, so we see a huge increase in the sale of organic food, and we also see that the interest in the "sharing" economy and the "circular" economy is growing quite rapidly," he says. The latest plan is also being promoted as a way to create more jobs for people who do not have high educational qualifications. "We believe that getting lower costs for labour is a big part in making it more rational to repair rather than just to buy cheap and throw away," the minister says. "If we don't change the economic incentives the change will never come," he adds. The cost to the Swedish government of these tax incentives is not huge. It will be 270m kronor (£24m) per year for the lower rate of VAT on minor repairs, and 190m kronor (£17m) per year for the tax refunds on the repair of white goods. Another reason for the Swedish government's innovation in this area of tax policy is that the economy and government finances are currently very robust. The economy is expected to grow by about 3.5% this year. In 2017 the government expects its income from taxes to outstrip its spending by 7.4bn (£667m) Swedish kronor, helping it to cut the national debt. "The Swedish economy is very strong," said the finance minister Magdalena Andersson. "We have the highest growth in our region, unemployment is falling and the large deficit we inherited when we took power has been basically wiped out."